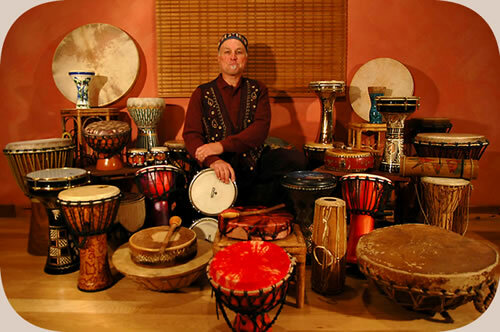 A “Circle of Drums… The Rhythms of Life” is Bill Kehl’s high-energy, hands-on, let’s-create-a-powerful-moment-together presentation emphasizing collaborative, creative individual expression while also exhibiting the benefits of synergetic group dynamics. With an ensemble of beautiful drums and percussion instruments of all sizes and shapes from around the world, Bill energetically facilitates a meaningful team-building experience that exuberantly celebrates the expansive nature of human potential and the ecstatic response to group rhythm-making. Considering the universal appeal and many applications for enhancing boundless team spirit that drumming potentially provides, it is Bill’s hope is that anyone and everyone who participates in this percussive community experience will enjoy an extremely powerful and wonderfully exhilarating body/mind/spirit encounter that will last a lifetime! I apologize if the program description for “A Circle of Drums… The Rhythms of Life” leans a bit toward the verbose (I learned in freshman year of high school that it’s another word for long-winded… ouch! ), but I simply tried to synthesize the many ways I have observed people experience the group-rhythmic dynamic. From the facilitator’s perspective, it is also the product of the many comments offered by participants during a drumming session, or to me personally in the afterglow of a presentation. I would also like to remind everyone that that “A Circle of Drums…The Rhythms of Life” is wonderfully exciting and engaging for kids, too. I offer many different versions of this program for all age groups, and I’m always amazed how children’s eyes light-up when they realize they are going to have a chance to play the instruments and create the music with me. Whether in a traditional artist-in-residency educational setting or around a night time fire-circle at camp, I can always count on their joyful responses. Let the fun begin!